We Buy Houses fast for CASH! Sell Your House Fast for Cash? We Buy Houses any condition! We buy houses in Erie fast and for a fair price. Get Your GUARANTEED Fair All Cash Offer Now! Are you currently facing any of these situations? Do You Need To Relocate Quickly And Need To Sell Your House Fast? If you answered “yes” to one or more of these questions, we can help to sell your house fast! We are specialists in solving real estate problems… especially ones that pose a financial burden on you, the homeowner. We can solve almost any financial problem that your property is causing. 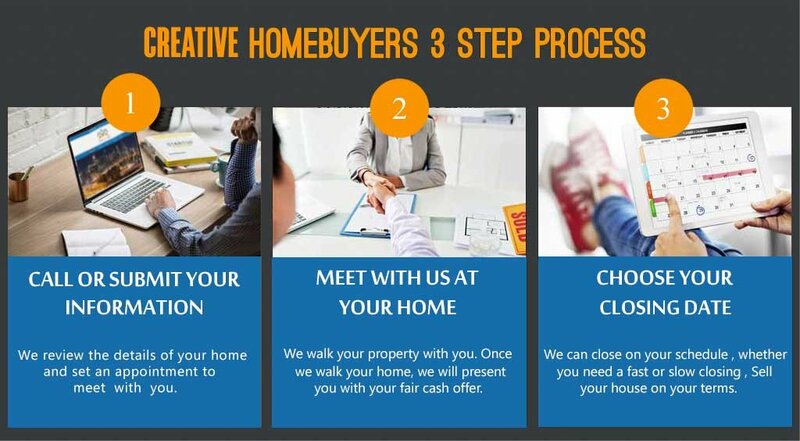 We create an offer that works for you and fits within your timeframe. If you have any questions about how it works, give us a call at 720-263-4447 or fill out the quick form. Nancy’s husband passed away while she was facing foreclosure. We had our lawyers help her with probate and got her appointed as personal representative of the estate. With our help Nancy sold their home to us and received a check a closing. Our passion is helping people, this is the best part of the job. Louise contacted us and we immediately met her at the property the same day. After we took a tour of the property, we made her a cash offer. She accepted the offer and we closed the deal. Please contact Creative Home Buys to learn how we can help you today 720-263-4447.
divorce, loss of job, illness and many other factors. Creative Home Buys can help most homeowners by buying their home “as is” for cash, with no realtor fees! This alone saves the average homeowner $10,000-$15,000.00. We are here to help- please contact us at 720-263-4447. Real Estate Investor Vs. Real Estate Agent:What’s the Difference?